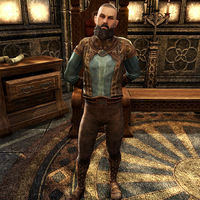 Duke Nathaniel is the nobleman who rules the duchy of Alcaire, a land that covers much of western Stormhaven, including Koeglin Village. Duke Nathaniel helped to cement the Daggerfall Covenant through a political marriage to Duchess Lakana, the daughter of King Fahara'jad. "Tell me you don't come bringing more bad tidings. I've already heard about the slavers on the shore and the cultists in the hills. I don't mean to be rude, but I have enough concerns. It's probably better if you speak to Sir Hughes." "Why would someone do this? Where were the Knights of the Flame? Why weren't they protecting my wife? There must be something...anything...that will explain this. Search the castle!" You! You spoke with her, didn't you? What do you know of this? Tell me!" Sir Hughes is responsible for this. "Sir Hughes? Was he mad? He was supposed to protect her! How will I explain this to Lakana's father? To her sister? Lakana would never hurt anyone. She was innocent...my beloved wife." "I don't understand. Sir Hughes served me for so many years. Loyally. Faithfully. Why would he murder my wife?" His dreams suggested Lakana would destroy Alcaire Castle. "Dreams? That maniac murdered my wife on the basis of a dream? He will die for this! You must help me find him. He's probably gone to Firebrand Keep. Please, do it for Lakana. Find Hughes and kill him!" I'll find him, Your Grace. Duke Nathaniel can be found in the keep after the player leaves Sir Hughes' dreamscape. "Sir Edmund sent for me, and I came as soon as I could. Sir Hughes does not plead for clemency, yet he says his mind was not his own?" He was under the influence of a Daedra, but it's dead now. "As strong as my anger may be, I sense truth in your words, and some change in Sir Hughes' character. But he murdered my wife, and for that, I can find no forgiveness." Then you will have him executed, Your Grace? "He asked me to take his life and restore honor to the Knights of Flame, but my emotions are too strong. I cannot trust myself to make the right decision. You were in his dream. You saw what drove him to murder. You must decide his fate. Let him live. He wasn't in his right mind. Duke Nathaniel:"Then Sir Hughes will have his wish and Lakana will be avenged. Go ahead, Sir Edmund." "Sir Edmund will stay on as leader of the Knights of the Flame. He is a good man, and loyal. Though I fear I will never trust anyone fully again." "The honor of the Knights of the Flame has been restored, and Lakana's murderer is dead. However, nothing can bring my wife back." "The Spirit Wardens of Pariah Abbey. They dabble in daedric rituals, but they are benevolent. Speak to Brother Muran at the abbey. Ask him if the appearance of this Omen should be cause for wider concerns. If so, we should warn High King Emeric. "Thank you for saving my brother. To know that Sir Hughes is dead and that Vaermina's plot here was thwarted gives me much peace. I still mourn the loss of my sweet Lakana though." This page was last modified on 28 September 2018, at 18:51.